Patti and I always make our Date Night dinner something special. When Patti brought home these 2 inch Rib Eyes I thought these fit the bill perfectly for a reverse sear. 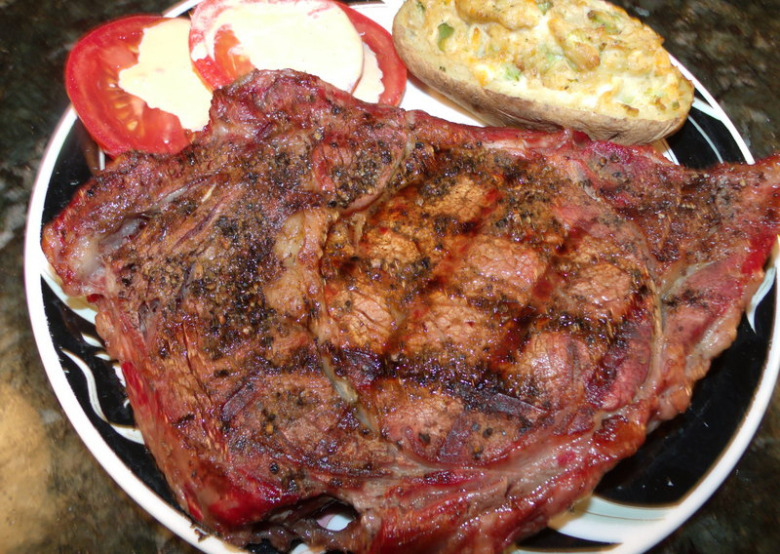 The reverse sear/cold smoke method allows for a much deeper smoke flavor on meat, chicken, fish, seafood, game and cheese without actually cooking the food before grilling. So, I used the probe on the remote and just let it sit in the smoke to about 100 degrees (38c) then pulled the meat and put the heat to my grill grates to get ready for a really good sear. As a special treat we were given some of Lumberjacks new “Lumber Jill” Italian Blend garlicwood pellets adding a nice smoky garlic flavor to our Rib Eyes. Very nice, you have got to try these. So after the grill comes up to temp and burns clean turn it back down to 170 degrees (77c). Place your Rib Eyes directly onto the grill and just let it hang out in the smoke and get happy for an hour or so. This is referred to as “Smoking” or “Hot Smoking and it is enough to open the pores so that the meat can pick up all the flavor of the smoke. I used the probe on the remote and just let it sit in the smoke to about 100 degrees (38c) about an hour. For this part of the cook time doesn’t matter, we are going by temperature. I then pulled it and set it aside and turned the grill up to 400 degrees (205c). When my Grill Grates were screaming hot I put the steaks back on for 5 minutes per side with a quarter turn at 2 ½ minutes. For medium rare pull the meat reaches an internal temp around 130 – 140 (55c), cover it and let it rest for 10 minutes before serving. This will be medium rare. Keep in mind that the meat will continue cooking for another 10 degrees after you pull it off the grill. So for medium pull it at 140 (60c) and overdone 160 (72c). I use a Maverick ProTemp Instant Read Thermometer for checking meat temps. The important thing to keep in mind is TIME & TEMPERATURE. You can even do some of them in the oven or crock pot, but, then you lose all the flavors you get from cooking outdoors. But sometimes it does rain. I am still unable to get a good sear, evan at 500 degrees.I am using 2″ steaks at 5 – 7 minutes per side. Any suggestions would be appreciated. Hi Roger there is a product called Grill Grates, they absorb heat and will help with the searing. Roger, did you solve your searing issue? If not I may be able to help. I did; bought a Weber kettle for steaks.